Where did the pond go?? Drought and more drought. Did you ever think you would get tired of a sunny day? We usually never have to feed hay until the first freeze, usually in December. We have been feeding hay since August and are lucky to have it. 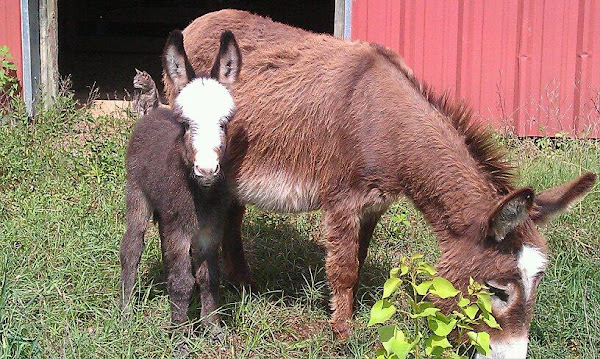 We use a 10% dry mix feed for our donkeys that are young or dam's with nursing foals. We are having to supplement feed also. Donkey owners be careful not to feed free choice alfalfa or a high protein sweet feed. Donkeys don't need that. They have lived for thousands of years on scrub. They are tough. If you can't find or afford coastal hay then use a dry mix feed and some hay cuts bagged from the feed store. Make sure your animals still have lots of water and that salt/mineral block or loose mineral. And remember to get a donkey hug every day!